With Holiday entertaining around the corner, and football season upon us, I was reminded yet again that it would soon be time to use my eyesore of a card table. Being a lover of spray paint, hot glue and all things frugal and crafty, I knew I could bring her back to her glory days. I just needed to decide the look I was going for. It could not be a boring little nip n’ tuck, it needed to be something fantastic, with a huge “wow” factor. 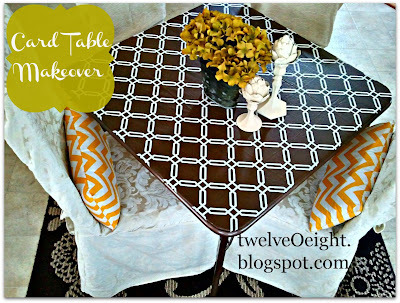 A go-big-or-go-home-card-table-makeover. While picking up summer dishes and entertaining supplies earlier this year I spotted a cute flannel-backed vinyl table cloth while shopping. 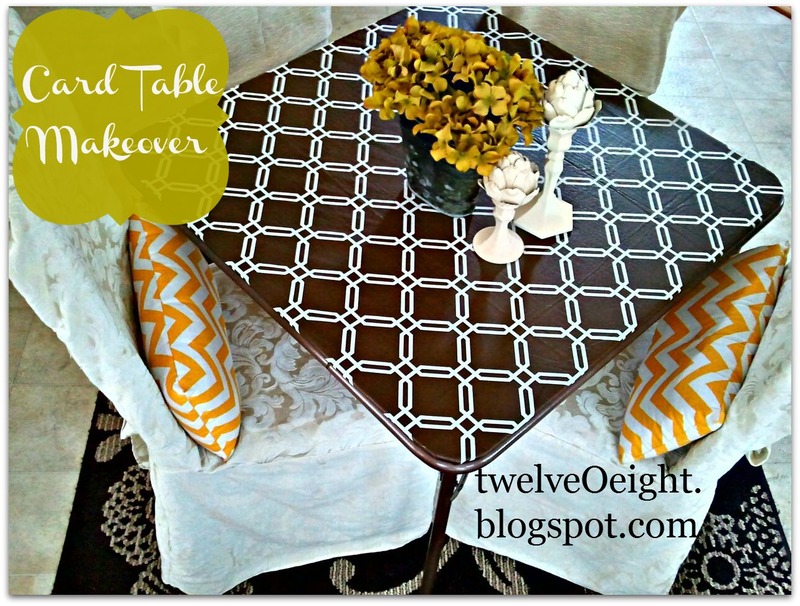 We ended up not needing it outside this summer on our patio table, and I loved the color and design so I hung onto it in my craft room waiting for inspiration to strike. And strike it did. 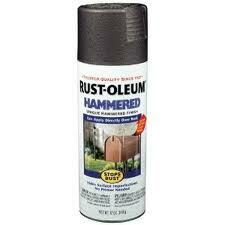 Enter the paint, Rustoleum’s Hammered Finish Spray Paint in this rich, warm brown. This little makeover was picking up speed. Card table, the more disgusting the better. Mine had served as my painting table for far too many years while not being used for entertaining. 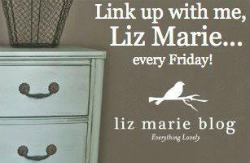 Spray paint in your color of choice. 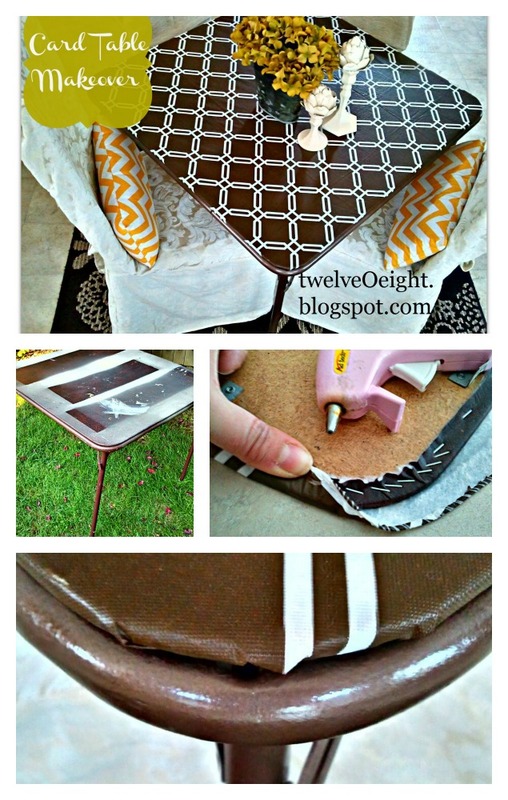 Vinyl table cloth or fabric to recover your table top. 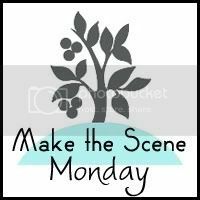 Hot glue, scissors, tools to disassemble and reassemble your table. I removed the table top from the base of the table and applied two coats of this hammered finish spray paint. In the before picture below you can see that the table was already brown, but it was boring. Not sparkly, I like sparkly. So, as the base of the table dried, I moved on to recovering the top. I smoothed out the table cloth on my kitchen island, fired up my glue gun, and placing the table top face down, trimmed around the edges of the table cloth. Gently pulling the vinyl around the edges, I folded it under and glued it down so it would be smooth with no pulling or sagging once the table was back together. You could also purchase vinyl at the fabric store, or use fabric (which would not be waterproof) so I opted for the table cloth, plus it is pretty, and that usually is the deal maker or breaker for me. When the table base was completely dry, I re-attached it to the table top and I was now ready for some awesome fall entertaining, dinner parties, and football gatherings. Being banished to the card table no longer needs to look dull when you have given yours a proper lift. I hope this has inspired you to see what you may already have on hand in a new light. In less than one hour I think this table definitely went from sad to fabulous. The best part, I will be using this as my dining room table while I am refinishing my main dining room table in the garage sometime soon. Dual purpose, love it! Great Job! I have been thinking of re-doing mine because they are who knows how old and super dingy. And I thought I had had an original idea! This is fantastic! 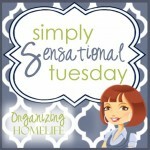 I am so pinning this to do before Thanksgiving! Gorgeous! I have a card table similar to this and I am now eyeing it for a potential makeover. Yours looks so fantastic. that is a clever idea. Love how it turned out! This looks awesome! So much more classy than an average card table! Great job (love those pillows too!) Thanks for linking up to Gettin' Krafty! Hi Tanya! What a great idea and it looks so beautiful, wonderful thinking! Have a nice day and week! Very clever! I would need the Hershey bar for sure!! Thanks for sharing this great idea! 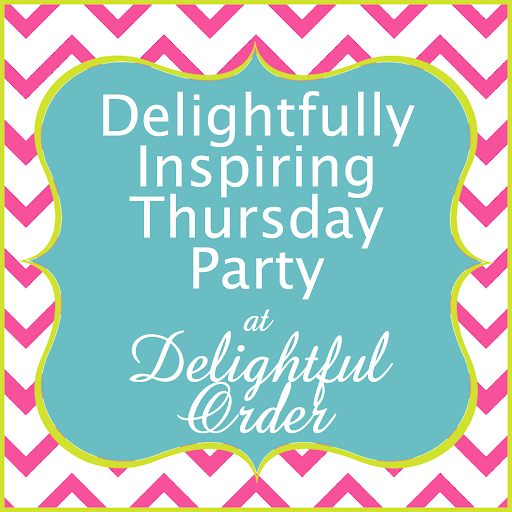 What a fabulous idea – it looks great! Can I have the table? I promise to play cards 10 times a day. Please? It's Laurie @ House of 34 again… I wanted to ask you a question, but I don't have Outlook email. Would you mind sending me a quick email so I can contact you? lhutchinson36@gmail.com Thanks! I did this with two folding tables. It's still hot-glued in place, so guess that stuff is strong! Amazing Tanya! What an inspiration to us all how we can turn something that we already have that is not so nice to look at, and for a couple of bucks turn it into something you wouldn't want to put away. My card table has been my craft table for more years than I can remember… I shall keep my eyes open for something cute to make mine amazing too. Awesome! This same idea came to me as I was falling asleep the other night, but I wasn't sure what would be the best way to do it – I will use yours! Visiting from cozylittlehouse. This is a great idea! I have a nasty but useable card table that may just get this treatment. Thanks for sharing it. Wow, this is such a great idea! Love how it turned out. 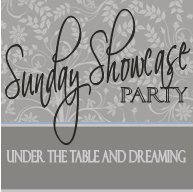 I will be featuring you on Sunday! : ) Have a great weekend! Great job and I love the colors you have chosen! Thank you for sharing! Great idea! I have one I need to do. I told a child to use "the card table" to work his pottery clay. He used the textured one. It hasn't been the "good" one since! This looks great. What an idea. Definately keeping this in mind. This is awesome! I have a card table that's seen better days. (That's most my bad. Crafting is a dangerous hobby.) I really want to give this a try. Thanks for sharing. Love from your newest follower, Whimsically Homemade! Thanks so much for sharing at Gettin' Krafty! 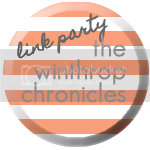 You were featured this week so come on by and grab a button! nice, i love the print!! plus the chevron pillows!!wow!! Just linking up again and wanted to say hi! AWESOME!!! I have an old card table just like that and I can see now that it needs a makeover too! Thanks for the inspiration! AOJTkh Thank you ever so for you blog.Really thank you! Great.